In an increasingly competitive market, job seekers look for a company that can offer them the right “package”. This includes career development, job satisfaction and fulfilment, and of course, pay and benefits. A benefits strategy is one of the tools that employers have up their sleeves to utilise in their war for talent. With a limited talent pool that operates as a common source for more and more organisations to fill their employee needs, a comprehensive benefits strategy can be the answer for attracting the right kind of employees, and improving engagement and retention. What follows here is drawn from this year’s Towers Watson study conducted between February and March early this year called the 2013 Asia Pacific Benefit Trends – Optimising Benefits for Competitive Advantage. The study includes responses from 1,066 employers around Asia-Pacific and includes regional as well as country specific data for China, Hong Kong, Indonesia, Malaysia, the Philippines, Singapore, Taiwan and Thailand. This is the third time the study has been conducted in this region by Towers Watson. The study looked at a variety of topics related to compensation and benefits in order to identify company attitudes, and also the benefits and challenges faced while researching and implementing such strategies/packages. Additionally, the study aimed to better understand what is included in packages offered by companies. The million dollar question, is of course, how to optimise your benefits strategy by offering attractive benefits that will mark you as an employer of choice, whilst also managing cost. The study found that many employers are accomplishing this balance by thinking innovatively about the way they design, communicate and administer benefits packages. One way of achieving this is by adding flexibility to benefit packages, which allows them to cater to the diverse needs of their workforce with a wider range of benefits, enhancing value perception in a cost-effective and streamlined way. The study found that across Asia-Pacific, benefits are continuing to grow in importance as a reward lever. The vast majority of employers have a documented benefit strategy to guide their ongoing benefit decisions. Sixty-two per cent of participants have reviewed their strategy in the last 12 months, confirming that benefits are high on employers’ agendas. Looking at individual countries, one-fourth of employers in Malaysia and Singapore do not have a documented benefits strategy. China and Taiwan are ahead in the region, with close to 90% of employers in China and a staggering 98% in Taiwan having a documented benefits strategy. The 2009 Towers Watson’s Asia Pacific Benefit Trends study found that 34% of respondents did not have a corporate benefits strategy in place, and 38% last reviewed their benefits more than 12 months ago. The dramatic shift in both numbers in the 2013 study, indicates the importance employers are placing on their benefit programmes. The study highlights that in the current war for talent, attraction and retention of critical skill employees is a key business goal for employers. Benefit strategies are no longer offered simply to comply with regulations or to follow market practice, but are used strategically to support business goals and influence employee behaviour. Among employers from all countries that participated, improving attraction and retention was on top of the list. Other major factors for implementing and documenting benefit strategies included controlling costs, improving employee perceived value on benefits and improving employee engagement. When it comes to objectives and challenges that employers attribute to their benefit strategies, employers see the need to offer an attractive benefits programme to differentiate from the competition while at the same time trying to balance against continuously rising benefit costs. One-third of employers are planning to increase the number of benefit programmes. Furthermore, the number of employers planning to introduce or increase flexibility in their benefits is set to double over the next year. Thirty-two per cent of employers plan to increase flexibility in the next 12 months, and 23% plan to introduce it. Medical costs are a significant part of organisations’ benefit spend. The table makes it clear though that some employers are beginning to think more holistically about their health programmes, particularly in the area of wellbeing. 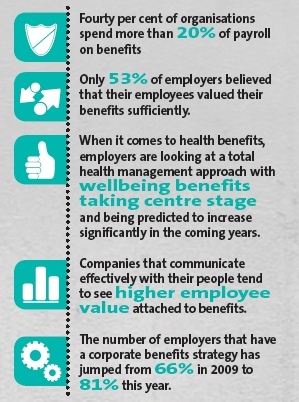 Employers are looking to a total health management approach rather than just providing benefits that treat illnesses. They seem to be moving towards preventive wellbeing. For example, lifestyle management benefits such as lifestyle coaching and weight management programmes are either currently offered or will be offered by a quarter of employers in the next 12 months. Stress management programmes already see 19% prevalence, indicating that employers in the region are listening to employee feedback and taking a proactive approach to addressing stress-related issues. Moving beyond these programmes to prevention and lifestyle management programmes will have ripple-effect advantages of decreasing absenteeism, improving employee engagement, and increasing productivity, in addition to keeping employees happy. Companies may decide to implement changes in their benefits strategy by following best practices from the market. What are competitors offering in terms of compensation and benefits, for example? However, there is a risk that employees may be looking for something different. The best strategy would be to listen to employee feedback, and after checking the budget available, decide what sort of benefits packages would work best for a specific company’s workforce. To conclude, one can see the increasing importance of compensation and benefits around the world, and more specifically in the region. Costs remain high, especially in Malaysia, however, the benefits for the organisation of a strong strategy and implementation system cannot be overlooked. Finding a way to reduce cost will always be a struggle, but there is much ground to be covered with many new, innovative ways – in an era where benefits can take many fresh, unconventional forms, companies can do much to demonstrate their innovativeness, as well as their commitment to their people. Next article What's Your Hero Like? How Do You Thrive In A Changing Landscape?